Genetics and behavior can be causes of bloat in Labrador retrievers. Bloat is a life-threatening condition that occurs when gas is trapped in the stomach. This can lead to your Labrador retriever’s stomach twisting 180 to 360 degrees, a condition called gastric dilatation-volvulus syndrome. Labrador retrievers as a breed are susceptible to bloat. 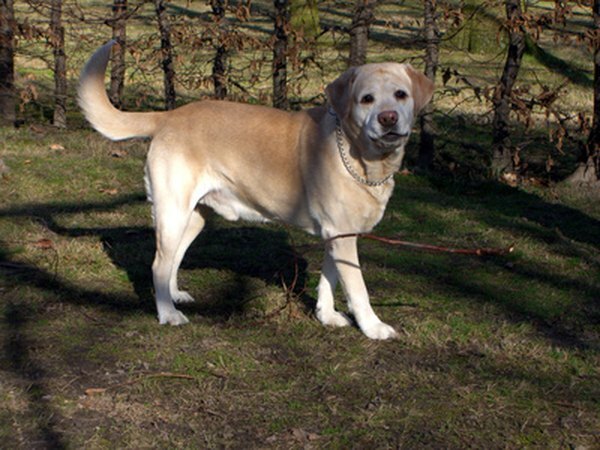 Labrador retrievers are deep-chested, making them susceptible to bloat and gastric dilatation-volvulus syndrome. The cause of bloat is unknown, but certain behaviors can make it more likely. Bloat might occur if your Lab exercises soon after overeating and drinking. If he has gas, it can fill his stomach and cause pain and distress, causing the stomach to twist. The twisting impedes blood circulation and blocks the connections with the esophagus and the duodenum. Bloat can occur in Labs of any age, and it can cause death within hours. If your Labrador’s parents suffered from bloat, it is especially important to watch your dog for bloat symptoms. Early treatment can save your Lab’s life when bloat and gastric dilatation-volvulus syndrome occur. Initial symptoms typically include swollen stomach, anxiety, whining and general discomfort. Other symptoms can include unsuccessful attempts to vomit, pale gums, increased heart rate and abnormal rapid breathing. If your Lab has any of these symptoms, seek immediate care. You can minimize the occurrence of bloat in your Lab by monitoring his food and water intake and his exercise. Bloat is reduced if you do not allow your Labrador to exercise after eating or drinking large amounts. Additionally, do not overfeed your Lab or allow him unlimited water during meals. As Labs are tall dogs, consider using elevated food and water bowls for easier digestion. Always observe your dog's behavior after eating and during play. If you believe your Lab might be suffering from bloat, see your veterinarian immediately. If it's after-hours, seek emergency care, as timing is important to treat bloat. Once the vet assesses the severity of the condition, he'll either insert a tube into the stomach or operate. The tube, which is less invasive, frees the trapped gas. If the bloat is severe and twisting has occurred, surgery is necessary to correct the twist.